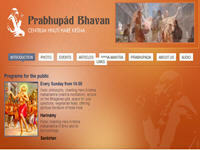 The official website of ISKCON Brno – Prabhupada Bhavana where Sri Sri Gaura Nitai are the presiding deities. Prabhupada Bhavana literally means “house of Srila Prabhupada”. The name “Prabhupada Bhavana” represents the desire of members of the Centre who look forward to serve Srila Prabhupada by following in his footsteps and spreading his message. Category Czech Republic April 30, 2012 by ISKCON Desire Tree.